The earliest data on inhabitation in Hiekka can be found in the 18th century maps. In the 17th century the area was cultivated and there were also several pitch cooking houses. 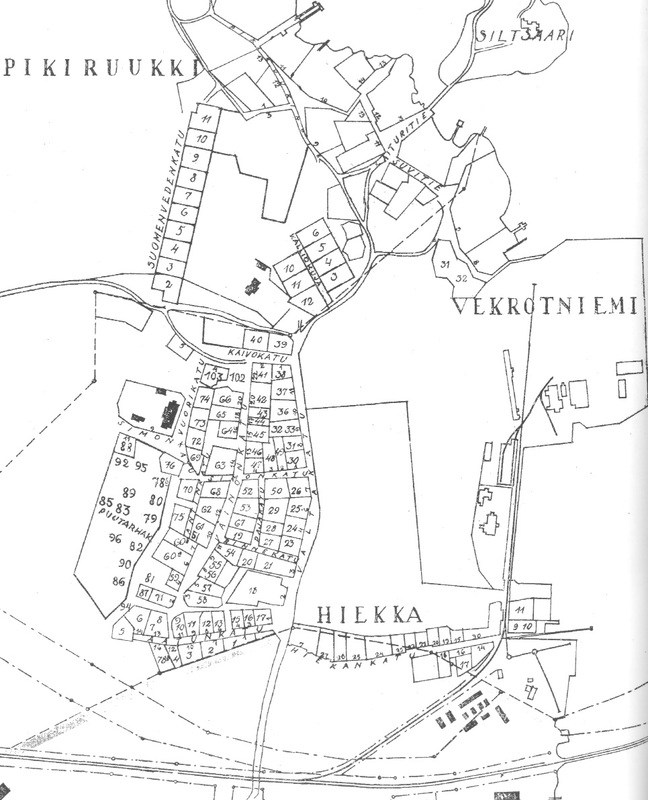 Hiekka area was still divided into two areas at the beginning of the 19th century. One of the areas was on the narrow zone south to Vektroniemi sawmill and the other to the north on a rock. It was called Pavlovsk. It was a part of Monrepos lands and thus all the plots were rented plots. The first inhabitants came to the Pavlovsk area at the beginning of the 19th century. In 1896 there was a large fire in Pavlovsk as a result of which 80 families were made homeless and the material damages were extremely large. In the aftermath of the fire, Monrepos fire brigade was founded in 1896. Hiekka was incorporated into the town in 1933 when the whole area was named Hiekka. Inhabitation increased rapidly and at the end of the 1930s town planning was extended to Monrepos. The new plots were partly built by 1939. The sauna building of a sauna cooperative was finished in 1934. It was possible to travel by the ships of a steam pinnace cooperative from the northern harbour to Hiekka. The ships also drove from the northern harbour to Pikiruukki, Papula, and Huusniemi park. Vektroniemi sawmill was established in Hiekka in 1899. Due to this, inhabitation increased rapidly in Hiekka area. The sawmill was remodelled in 1925 and 1937. In 1937 the sawmill produced 9000 standards of diverse timber. A blind track was built to the sawmill to enable direct transportation of its production to the harbour.